Laparoscopy is the most common surgical procedure for the diagnosis and treatment of Endometriosis. A Laparoscopy is a relatively minor operation when used purely for diagnosis. It is when additional surgical treatment for Endometriosis is performed during a Laparoscopy that the procedure becomes more invasive and would be defined as major surgery. The procedure is usually done under general anesthetic. This type of operation may also be known as key-hole surgery, and is one of the lesser forms of invasive surgical treatment available today. There are some hospitals that will perform this operation as an out-patient procedure, with the patient going home the same day. Many hospitals require the patient to stay over night, which allows for post surgery recovery to be monitored. This surgery is performed by first inflating the abdomen with gas, which is usually carbon dioxide, through a small incision near the navel. A long thin instrument called a Laparoscope is then carefully inserted into the inflated abdominal cavity to inspect the abdomen and pelvis. During surgery your body will be tilted slightly with the feet raised higher than the head. This allows some of the abdominal organs to shift upward toward the chest and out of the way. The gas that is used to inflate the abdomen helps to provide a better view inside the abdomen by pushing the abdominal wall and the bowel away from the organs in the pelvic cavity. This makes it easier for the surgeon to see the reproductive organs. The laparoscope is a slender tube, like a miniature telescope, that is inserted through the small incision just below the navel. It is equipped with a lens for a clear view. A special attachment transmits light down through the tube, into the abdomen, so that the surgeon can see the ovaries, fallopian tubes and nearby organs. Once the procedure is completed, the instruments are removed, the gas is released, and the incisions are closed. A few small stitches are usually placed to close the incision and the wound is dressed. During a Laparoscopic procedure, endometrial implants can be easily seen once these implants have reached a reasonable size. The implants that are still tiny cannot be seen by the naked eye. For an accurate diagnosis of Endometriosis, small biopsies should be obtained during laparoscopy. A biopsy is the removal of tiny tissue samples for examination under a microscope. Some biopsies will show that Endometriosis is evident, even though no endometrial implants are actually visible during the laparoscopy. This is why it is important to have a biopsy done when you have a laparoscopy, because some Endometrial implants can be microscopic. The same procedure for the diagnosis of Endometriosis, is used during surgical treatment of Endometriosis. Your surgeon may go ahead and use further surgical techniques to treat endometrial implants during the first operation that has confirmed the diagnosis of Endometriosis. This usually requires the need for a second small incision in the abdomen so that additional surgical instruments can be inserted. These instruments will be used to surgically treat endometrial implants in a variety of ways. For the surgical treatment of Endometriosis, your surgeon will aim to remove endometrial implants, separate any adhesions, also drain and treat any large cysts. 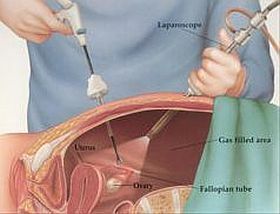 Laparoscopic surgery requires the use of various instruments to perform different repairs to any damaged tissue and organs caused by Endometriosis. Diathermy, which uses an electric current, may be used to divide tissue as well as coagulate tissue, particularly blood vessels to control any bleeding. Light energy in the form of lasers may also be used. Laser treatment can be used to ‘burn’ endometrial cysts and to cut away adhesions. The advantage of laser surgery is that the effect of the laser is very precise and reduces tissue damage. This will depend on what treatment is performed. If you are having you first laparoscopy with the aim of obtaining a diagnosis, then the laparoscopy usually takes between 20 to 30 minutes. If further treatment is performed to deal with endometrial growths and adhesions, it may last up to an hour. Laparoscopic surgery when performed successfully, affords much less post operative discomfort and a faster recovery than conventional surgery. Surgical techniques and equipment have developed greatly in the last few decades. Any form of surgery carries risks, and any form of trauma to the body will cause pain and post operative reactions.